Professional self-adhesive labels for use in deep freeze environments. The face material is a white, high-bulk 75gsm paper that has excellent whiteness, opacity and smoothness. The product has excellent laser printing qualities, especially on high speed machines. Also suitable for use on inkjet, copier and litho. The adhesive is an aqueous acrylic emulsion specially developed to work in a temperature range of minus 50C to plus 60C (minimum application temperature is 0C). It is designed for adhesion to goods to be deep frozen. (Labelling of already frozen goods should be handled with care and the surface should be free of ice and moisture). 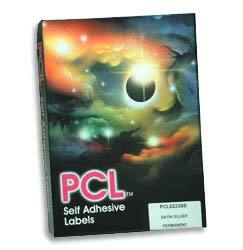 The acrylic adhesive is designed for safe use in hot fusing toner laser and copier printing. It is possible to use the adhesive as a semi-permanent for some applications at room temperature. Approved for indirect food contact and direct contact on dry and moist non-fatty foods. The adhesive conforms to EN71-3 (Toy Safety) Regulations and Packaging (Essential Requirements) Regulations. No heavy metals are used in the manufacturing process and typical contents are less than 1ppm. The backing is white high density kraft paper with excellent lay flat properties.